Craig Krull Gallery is pleased to announce representation of Kelly Berg, and our first exhibition of her paintings, Unknown Horizon. Working like the Roman god, Vulcan, forging calderas and caverns with deep, rock-like chasms of paint, Berg's illusionistic space offers no horizon, only an ever-changing, tumultuous world where time and space are uncertain. While this chaos is emblematic of our anxious age, Berg also includes pyramids as symbols of transcendence, providing an ancient human context within this shifting natural tangle of lightening and lava. She is stimulated by the sublime, wrangling with the conflicting emotions of fear and attraction, of terror and awe. Her lifelong obsession with extreme weather and geology began with childhood winters in Minnesota and visits to National Parks. 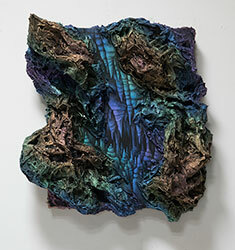 In recent years, she has been inspired by trips to the Meramec Caverns in Missouri and the Kilauea Caldera in Hawai'i. 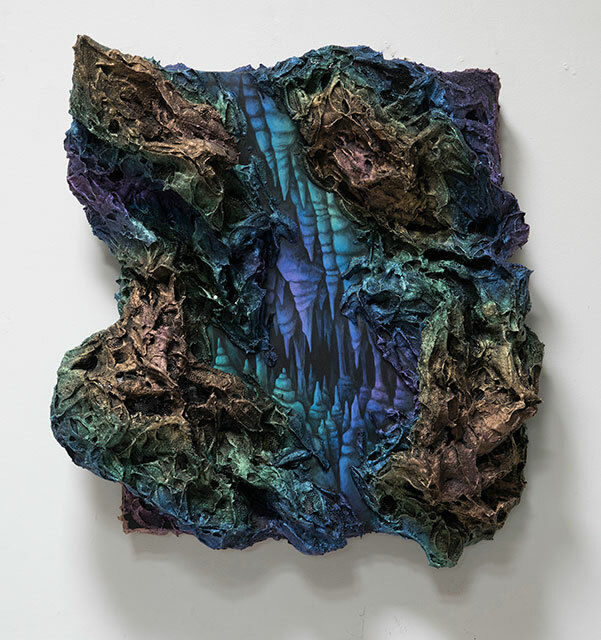 She employs acrylic, metal mesh, plaster, inks, scratchboard and other mixed media in a process she equates with geological layering and excavations, representing the fleeting moments of intense energy, the slow growth of stalactites, and the scratching away of time. Ned Evans' third solo exhibition at Craig Krull Gallery will feature recent paintings in the main gallery, and a new series of reliefs called Keyholes in the office space. 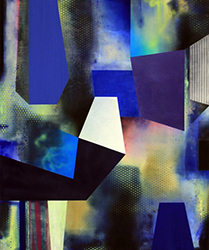 This latest series of paintings represents a continuum of Evans' earlier works, pushing the limitations of seductive texture and brilliant color, as well as dissection and re-assemblage of the geometric form, an ongoing exploration of concave colliding with convex, shadow colliding with light. The works hum and throb with a voluptuous energy, though in each there exist quiet respites to be found within the countless pathways and niches. Utilizing various mediums, Evans effortlessly integrates fabric, paper, acrylic paints, and texture additives, building intricate compositions rife with vibrancy and verve. Evolving from the compositional elements of the recent paintings, the Keyhole wall reliefs are assemblages of thick foam, coated with resin and encaustic oils. These reliefs are cubistic constructions that are tightly joined, like an Inca stone wall, yet they leave a tiny gap in the center that acts as a portal or black void.